If you’re a major league player whose name is mentioned in the same sentence as Babe Ruth, you’ve done something pretty special. 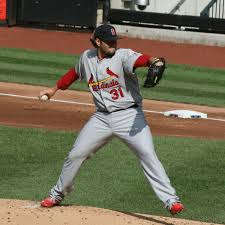 Just ask St. Louis Cardinals pitcher Lance Lynn. Lynn is in his fourth season in the majors. He has compiled a 38-19 record. He had a “no decision” in his team’s loss last night to the Brewers. This season he is off to a 4-1 start with a 3.60 ERA. It’s a good start, but where does the Babe Ruth reference come in, you ask? Of Lynn’s 38 career wins, 12 of them have come in April. In fact, he is 12-1 in April in his career, a .923 winning percentage. Of all the pitchers in MLB history who have started 10 or more games in April (and March), Lynn’s 12-1 record and .923 winning percentage is third all-time. Based on research using Baseball-Reference.com, Lynn falls behind Ray Fisher (7-0) and Babe Ruth (13-1). Lynn is not the only active pitcher who has an outstanding record in April. A pair of Colorado pitchers Juan Nicasio and Tyler Chatwood both have career April records above .800; Nicasio is 7-1, .875, Chatwood 5-1, .833 in April games. Yu Darvish of the Rangers is 10-2, .833 in his career in April. Following are the pitchers who have winning percentages above .800 in April games (minimum of 10 games started in April to qualify for the list).